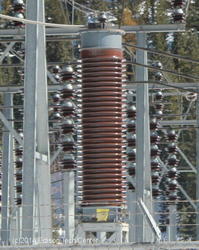 Our product range includes a wide range of lightning arrestors and polymeric surge arresters. With thorough understanding of the relevant industry, we are offering a wide range of Lightning Arrestors. These arrestors are manufactured using optimum quality raw material and advanced technology. This is not a very expensive product but highly recommended for every construction. This range eliminates human and property loss. Our offered range has gained exceptional value amongst our clients for its defined features. Driven by technical excellence, we are counted as the topmost manufacturer, exporter and supplier of excellent qualityPolymeric Surge Arresters. The offered range is manufactured using quality approved raw material and advanced technology by our skilled professionals. Moreover, post manufacturing process goes through a series of testing procedures under the strict vigilance of our quality controllers. Our offered arresters are well-known in the market for their sturdiness, accurate dimension, easy installation and durability. Apart from this, our provided range is available in variety of sizes and other related specifications and at affordable price.